The start of 2010 marks plenty of New Year’s resolution from everybody. [firstpara] And if you’re one of those who slacked a bit too much during the holidays, you’ve probably thought of pursuing a more active lifestyle for a change. Well since you’re finally doing it, you would rather do it with style, right? Lucky for us, Crocs is willing to lend us a foot in the door of sports. Nah, they aren't offering shoes to wear on the game, at least not yet. The popular footwear manufacturer is introducing the all-new Crocs Prepair, the footwear to wear in between work outs, games, and training. Made specifically for athletes and anyone pursuing an active lifestyle, the Crocs Prepair is embedded with nano-silver which helps reduce exposure to athletes' foot and staph infections to keep your feet healthy. It is also ergonomically constructed to reduce muscle fatigue and even aids the body in recovering between athletic activities. Crocs Prepair can actually help you recuperate from fatigue. It is designed to assist in the repair and recovery process after strenuous sports activities, and is proven to reduce muscular effort up to 24.6%. It also reduces peak pressure by 50.2% while walking. Play all you want – a game of basketball, badminton, golf, or a simple jogging session, Crocs Prepair will get you back in good conditioning in no time just by wearing a pair. 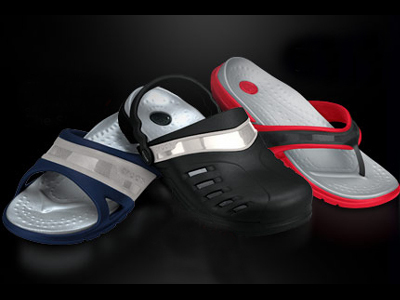 And if Crocs’ features still don’t get your attention, the wide of variety of color combinations and designs will. It is available in three unique shoes: a classic clog, an innovative flip-flop, and the traditional slide. While we here at FHM would gladly try a pair and see what Crocs Prepair is all about, our New Year’s resolution is to share more goodies to our loyal fans.